This picture was taken just at sunrise, and is a bit dark. 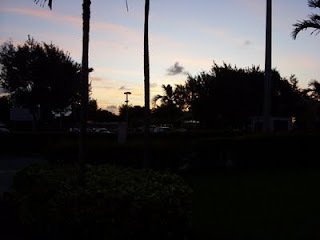 You're looking over the parking lot at the Shoppes of Wilton Manors. This is pretty much Ground Zero for the City. The place has a bunch of shops for the tourists to buy clothes, shoes, and the lot. It also has a great Pizza place, independently owned Coffee shop, a couple of large dance bars and other things. I find myself walking through there two or three times a day. When you live here, and as close to here as I do, it is the 500 pound gorilla of the neighborhood. Luckily it is always an interesting place to go and it does have the Poverello Thrift Store to snoop around from time to time. This shop also was where the current Renaissance of the city started. Poverello moved in to do their Good Work, the Alibi opened up and people started moving back. Before 97, it was said that you could have fired a cannon down Wilton Drive and never hit a soul since all the shops closed. The town was a No Go zone for Snowbirds like me, and now its gentrified and I'm here... walking the dog.